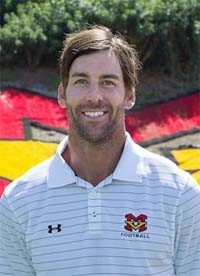 Rob Johnson was born March 18, 1973 and is a former quarterback and current assistant football coach at Mission Viejo High School. Johnson, a native of Orange County, California, played college football at the University of Southern California (USC) and was a fourth-round pick in the 1995 NFL Draft by the expansion team Jacksonville Jaguars. With USC, Johnson won the 1995 Cotton Bowl Classic. In the Jaguars' opening game of 1997, Johnson started for an injured Mark Brunell and had a breakout performance that set a record for the best completion percentage by a debuting starting quarterback. Johnson signed a $25 million contract with the Buffalo Bills the following season and was named starting quarterback by coach Wade Phillips but had a tumultuous, injury-ridden run with the Bills and a reputation for frequently being sacked that inspired the nickname Robo-sack. Johnson's injuries and poor performance led Phillips to replace Johnson with the more experienced Doug Flutie as starter. Controversially, Phillips decided to start Johnson instead of Flutie for the 2000 Wild Card playoff game that the Bills lost to eventual AFC champion Tennessee Titans, after Flutie helped the Bills to an 11-5 record in the 1999 season. After two losing seasons with the Bills, Johnson joined the Tampa Bay Buccaneers for 2002 and won a Super Bowl title with the team. Johnson played his final games with the Washington Redskins and Oakland Raiders in 2003. He also tried out in 2006 for the New York Giants and in 2008 for the Tennessee Titans. In 2004, Johnson became an assistant football coach at Mission Viejo High School with his brother, both under their father as head coach. Football stars such as a Rob Johnson have taken the game to new heights by excelling at their respective position. The booking agents at AthletePromotions can assist with Rob Johnson speaking engagements or appearances from NFL stars. We have years of experience in booking gridiron greats for keynote speeches and autograph signings. Hiring a football speaker like Rob Johnson is not a hard process. Our agents can provide availability, fees and all costs associated in bringing out a successful football star to your next corporate event. We can find Rob Johnsons agent to make this booking happen. A Rob Johnson appearance will add energy to your upcoming event and reward employees, customers and clients.Most likely, football fans and corporations can find Rob Johnson's official website, charity involvement, Twitter account, representation, publicist and management info at www.Rob Johnson.com.